If you haven’t joined the Facebook group “Homeowners For Florida Friendly Yards” you probably aren’t aware of all the recent conversations about upcoming hearings, more homeowners being sued by their HOAs and increases in HOA Directors’ insurance and huge deductibles after one lawsuit was won by the homeowner. Kudos to all those who continue to help conserve our natural resources and keep from contaminating our water supply by standing their ground! Today a Summary Hearing was held in the Judge’s chambers in Duval County about the lawsuit Marsh Sound HOA filed against one couple for what began as eight violations for installing a Florida Friendly landscape. As “spectators” were permitted I decided to attend to get a better insight into one Judge’s thought process. During the course of the past year the complaint’s original eight counts was slowly whittled to only one count (I don’t think the others could “stick”) which was the “common area” of the yard between the sidewalk and the street (the Plaintiffs’ side) and the lack of acceptance or denial by the HOA within the 30 days as stated in the HOA bylaws (the Defendants’ side). My photo of Sidles’ yard taken June 1, 2013. The opposing attorney explained to Judge Flower that the HOA strove to maintain a uniform appearance of the “common areas”, i.e. the right of way between the sidewalk and the street with St. Augustine grass, especially since the Defendants’ house is on the “main” road of the community. 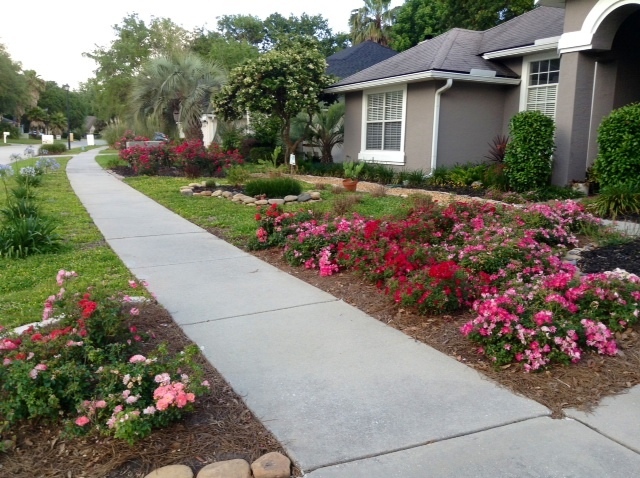 When the Judge asked if any of the other right of ways were planted with other than St. Augustine grass the HOA attorney apparently forgot about several other right of ways on the same street that had almost 40% of the area planted with flowers, white rocks, cinch bugs or just weeds. Luckily the Defendants’ attorney was able to bring up to the Judge about another FFL yard that had been installed a couple years earlier and the Judge then asked if the HOA had sent letters to these or other homeowners to which the HOA attorney said no because the other yard was on a cul de sac and they were waiting before sending notices to the other homeowners. The Judge responded with “don’t tell me the HOA is waiting on the outcome of this lawsuit before sending any notices?” which resulted in laughter from the rest of us. Even though the covenants and restrictions state the homeowner “must maintain the right of way in a neat and attractive condition. Maintenance shall include regular mowing, irrigation, fertilizing and edging.” The right of way in question is planted with perennial peanut and agapanthus. Perennial peanut is a ground cover which can be mowed if desired and has been edged by the homeowners. No fertilizer has been applied as it is unnecessary and the water run-off goes directly into their lake which flows into the Intracoastal Waterway. The hearing was on the schedule for only 15 minutes but ended after approximately 45 minutes after Judge Flower asked both attorneys some tough questions they were not expecting. The Judge kept telling both attorneys he was more concerned with the “processes and procedures” of the HOA Directors’ in handling the issue…did the Board address things verbally to the homeowners or send letters, was there a defined procedure for the Board to follow and what was the history of the covenants and restrictions pertaining to landscaping from the original developers…any amendments, etc. in the following years? I happened to be at the Board meeting where the Directors verbally told these homeowners they would accept the yard design plan if it was able to be “Gold” certified by the County Extension center (after I explained the different levels of certification to the Board with Gold being the highest). After certification, the Defendants’ yard was the first Gold certified FFL yard in Duval County! In the meantime join the “Homeowners For Florida Friendly Yards” group on Facebook and read the comments from one homeowner about the HOA Directors’ insurance premiums doubling and the deductible going to $25,000 after their recent loss to the homeowners or other homeowners that are being sued or enduring harassment from HOA Board members and neighbors. All this is not a good situation for homeowners, HOAs, Directors or anyone! Word about the community and legal hassles will spread and no one will want to move into a community where HOA Directors file lawsuits arbitrarily. Folks, all this turmoil does not help increase property values in a community! We just won our lawsuit. My lawyer found that the HOA by-laws did not permit suing a homeowner for other than financial reasons. He said that the by-laws provided another solution in that they could enter the premises and correct the violation and then bill the homeowner. I’d check that.